Pay Per Click (PPC) PPC is an extremely powerful way to get targeted traffic to your website with little delay. Want to get your company’s services in front of your target customers as soon as possible? Then a pay-per-click (PPC) advertising campaign is for you. While SEO and local search are more affordable and take time to gradually ramp up, PPC is an investment in efficiency. It generates traffic almost immediately by putting you in the sponsored ads section right at the top of search results pages. 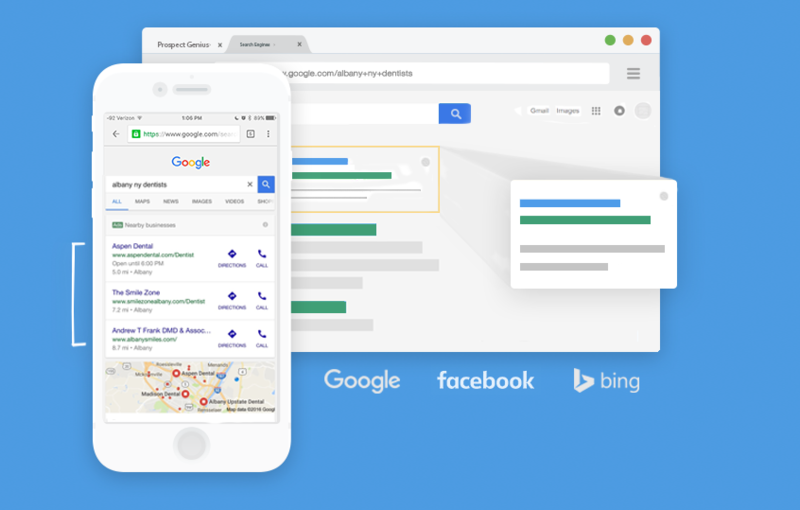 Whether the desire is to laser-target ads for specific geographic areas or to strike quickly on a new opportunity, professional PPC management allows for speed of action that other strategies do not. For business owners who don’t want to wait for months to get results, PPC goes into effect quickly (after only one month). For business owners who want to take an aggressive approach to advertising, PPC provides the opportunity to target your ads at all the right people. And did we mention fast results? Like other providers, we charge a percentage of your budget to cover PPC management fees. Unlike other providers, we charge much less than the industry standard of 40%-50% of your budget. Moreover, unlike other providers, we tell you exactly how much we’re charging. Other marketers typically won’t even mention this—they’ll just combine your PPC marketing budget and their PPC management fees into one lump sum. At Prospect Genius, we don’t think that’s right. We value honesty and transparency. That’s why we do things differently. We’re 100% upfront about charging you an AdWords management fee. Then, Google bills you directly for the rest. With us, there’s never any question about where your money is going. This makes our model more cost-effective, more transparent, and much more fair-minded than those of our competitors. If you want to start promoting your favorite services, sign up for our PPC services today!